Healthy, hydrated skin is essential as your puppy or kitten grows up to be big and strong. Besides that, wet, sudsy puppies and kittens are just too cute to pass up! At this stage in their life, puppies and kittens need special products designed to be so gentle that won’t disturb pH levels, irritate their eyes or irritate their sensitive skin. Healthy, hydrated skin is essential as your puppy or kitten grows up to be big and strong. Besides that, wet, sudsy puppies and kittens are just too cute to pass up! At this stage in their life, puppies and kittens need special products designed to be so gentle that won’t disturb pH levels, irritate their eyes or irritate their sensitive skin. Our gentle tearless formula is specially designed for puppies and kittens because it is made with a blend of Dead Sea minerals, vitamins C and E, oats, coconut oil, honey, pumpkin seed oil, nettle & essential oils. It will softly cleanse your pet’s skin and coat while providing essential vitamins, minerals and oils to help your pet grow strong, thick and healthy coats. Don’t have time for two-step grooming? 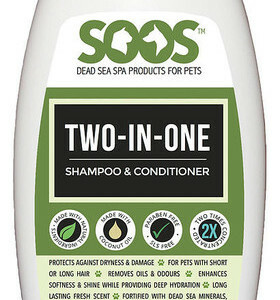 Soos™ Natural Two-In-One Pet Shampoo and Conditioner combines all of the exclusive, moisture-rich, immune boosting, benefits of Dead Sea minerals with coconut oil, beeswax, grape seed extracts, pro-vitamin B5 and vitamin E to gently clean, calm and cleanse your pet’s skin and coat all in one quick step. 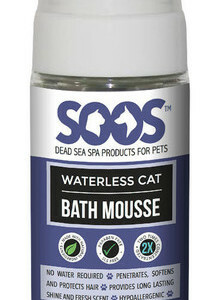 Whether your cat, dog or small animal hates bath time or your pet needs a quick “freshen up” between wet washes, Soos™ Natural Waterless Pet Bath Mousse combines all of the exclusive benefits of Dead Sea minerals with botanicals and essential oils like chamomile, sweet marjoram, and Vitamin C to gently clean, calm, cleanse and disinfect your pet’s skin and coat. No one wants to see their pet hurting but, unfortunately, injuries happen. Be prepared when they do. 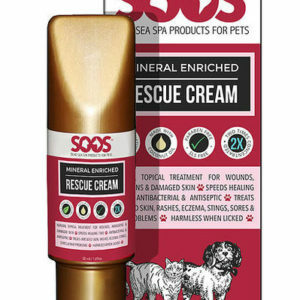 Our Natural Rescue Cream immediately treats dermal injuries and speeds healing because it’s a topical cream made with natural antiseptics and antibiotics. 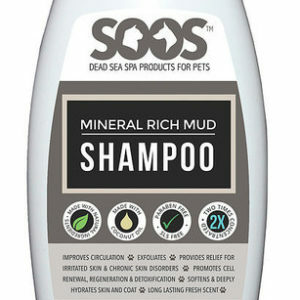 Boost immunity, detoxify, exfoliate, promote healthy cell growth, improve circulation and aid chronic skin conditions with Soos™ Natural Mineral Mud Shampoo. As our product with the highest concentration of Dead Sea minerals and antioxidants, this shampoo will give you the highest degree of Dead Sea Benefits.